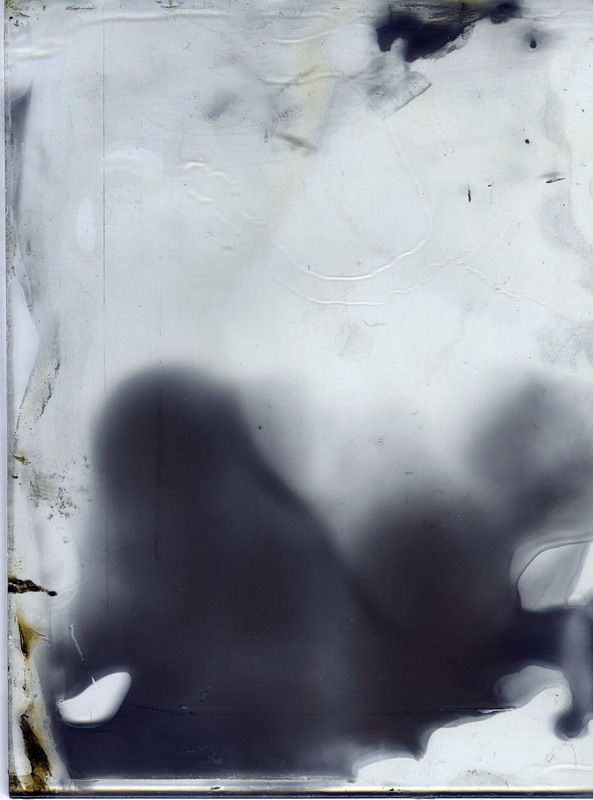 February | 2012 | Documenting Alternative and Historical Photographic Processes. 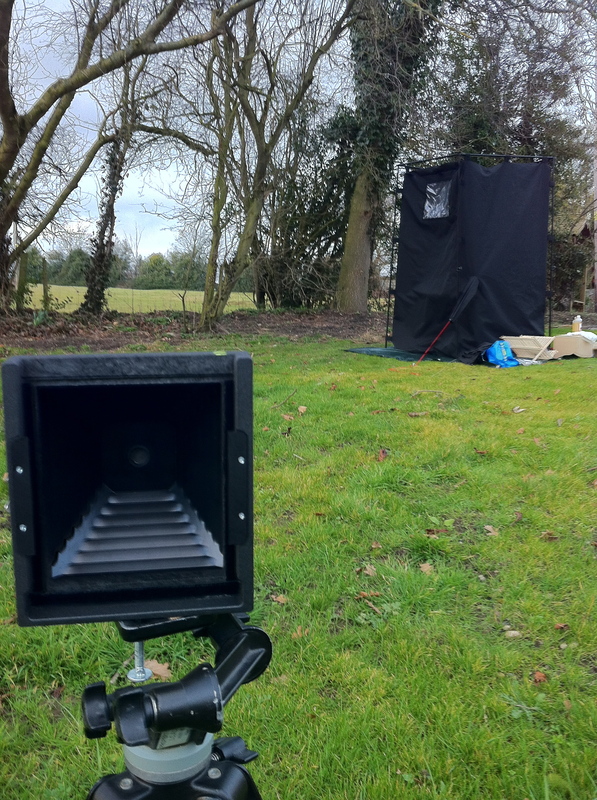 On reflection of the images I obtained from my first trial with the Ambrotype process my first thought was it must be an issue with exposure because of the type of camera I use, the newly developed Harman Titan pinhole camera. 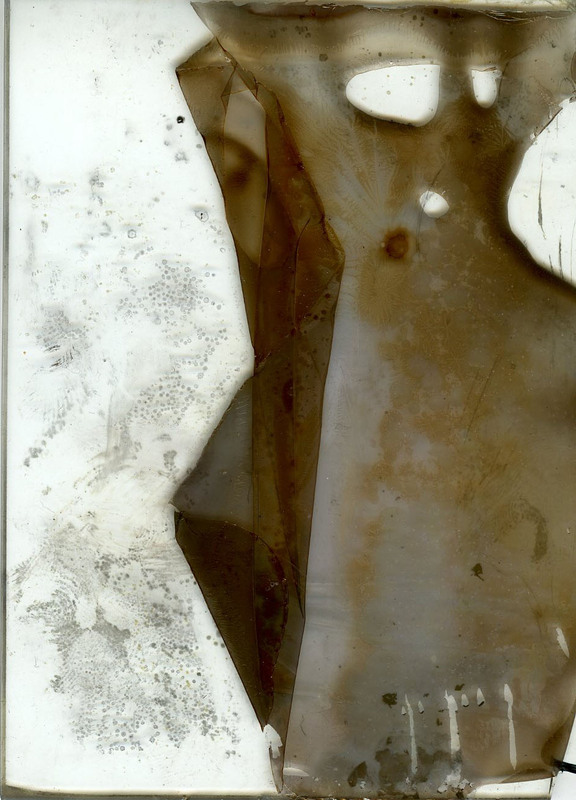 However, the sensitive nature of the technique has lead to a broader investigation on the problems that may have occurred and as a novice to the process I really do not know visually the results of the individual element that I should be looking for. This is mainly due to the fact that there is only a certain amount of practical knowledge you can gain from books, it is the doing in which I will learn, with time and experience. 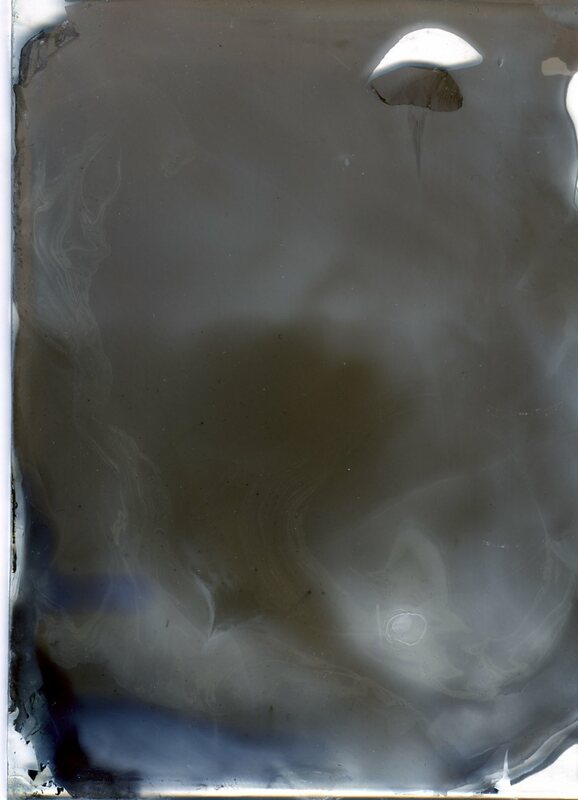 Whilst Pouring the Collodion I may have not left the Collodion for long enough before inserting it into the silver bath, which distorts the image. My silver bath may have gone wrong some how. 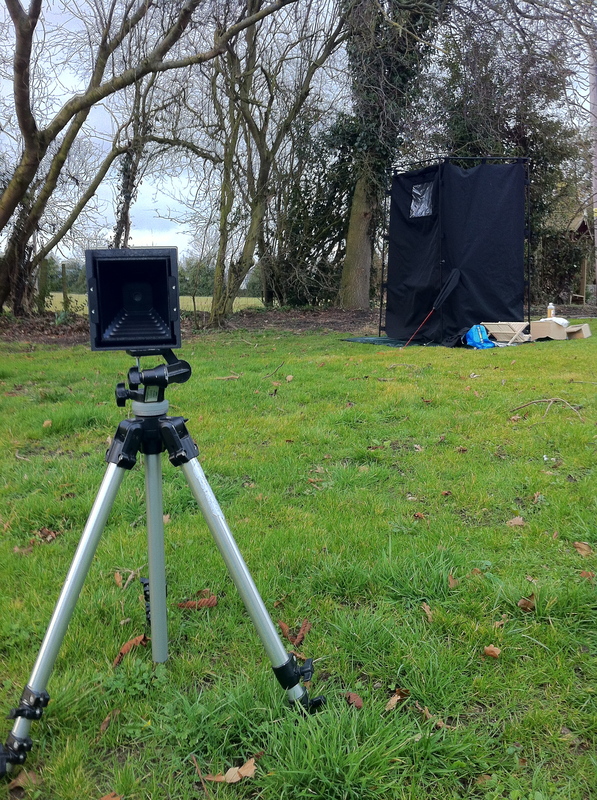 Exposure was far too short as the camera has a f number of 206, being a pinhole camera. 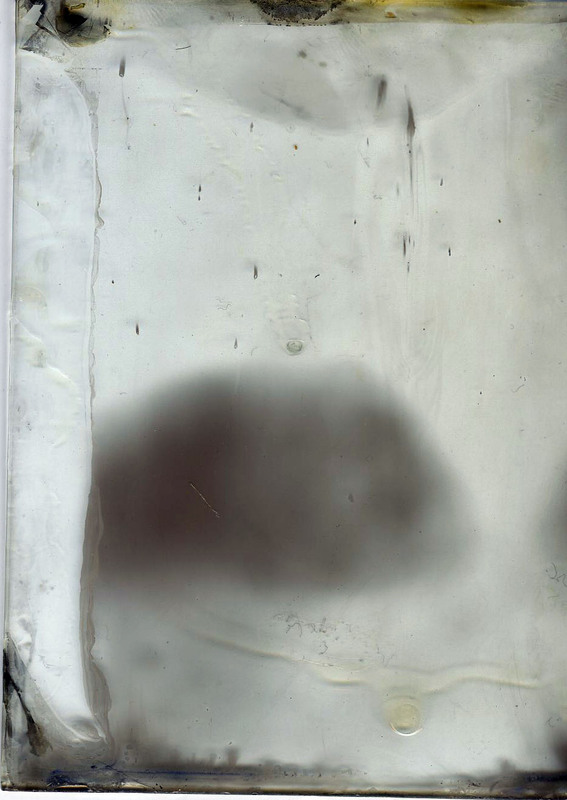 Simply leave Collodion for at least 15 seconds to test. 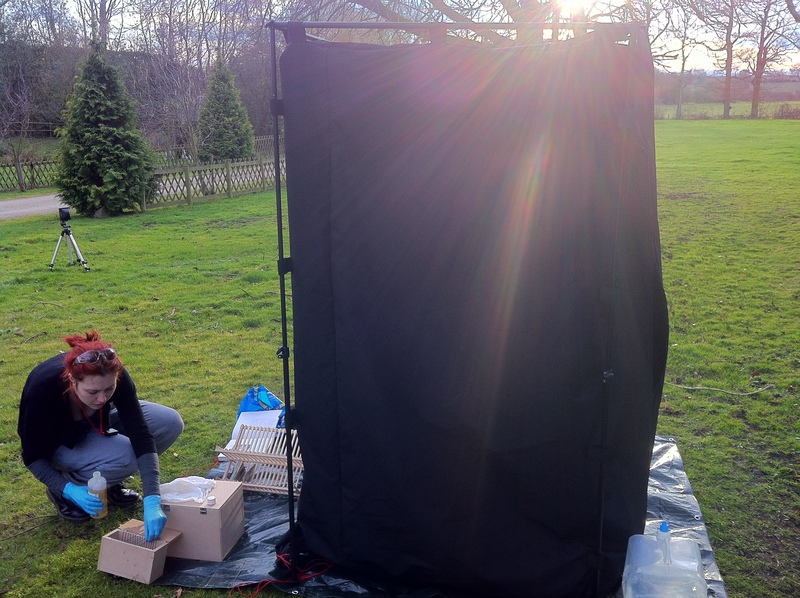 Unfortunately there is no guide line with exposure and using a pinhole camera has made my job slightly more tricky as the exposures with an f number of 206 will be very long and I may risk the Collodion drying. And so this element for experimentation will simply need to be continually tested lengthening exposure time until it is right. Now I had gathered and prepared as much as I could, I was now ready to test the process. 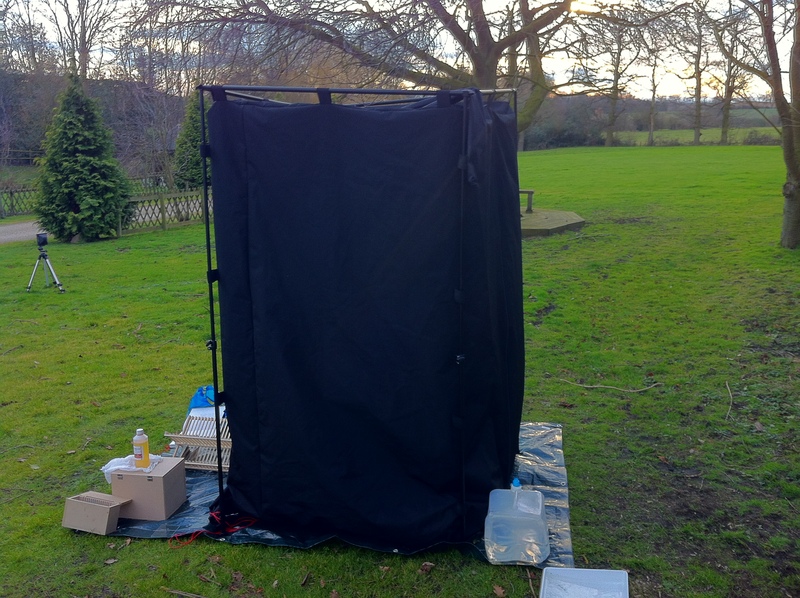 Firstly I constructed the darkroom (see earlier post) outdoor, this time however I used several ground sheet to protect and weatherproof the Nova Portable Darkroom. I inflated it with a power converter powered by my car just to initially gain shape of the structure and also to ventilate when necessary. Before I could start unpacking all the equipment there were aspects of the chemicals that still needed to be made up, the fix for example needs to be made fresh each session you use this process. Having to mix the the crystals and chemicals together, pouring from bottles to vessels has an almost an alchemic appeal to it. 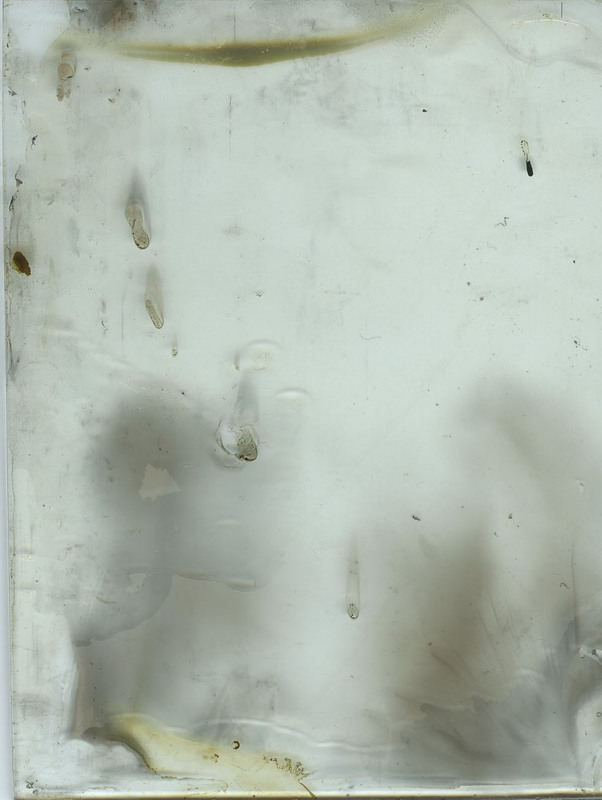 The smells and methodology begins to transport you to another time, it seems that the process you are now part taking in is more than just about the image, but about the experience of making. The commitment it has taken makes you not only see the landscape and what you are capturing in a new light but it also opened my eyes to a new world of working one in which the human hand plays a great part in the outcome of the image; the process becomes more of an science experiment and to master this would be perfecting an art. As I began to set out the equipment I realised that I was setting out a system of working that aspects of the process were going to be completed in different locations and therefore grouping the apparatus together here was essential. 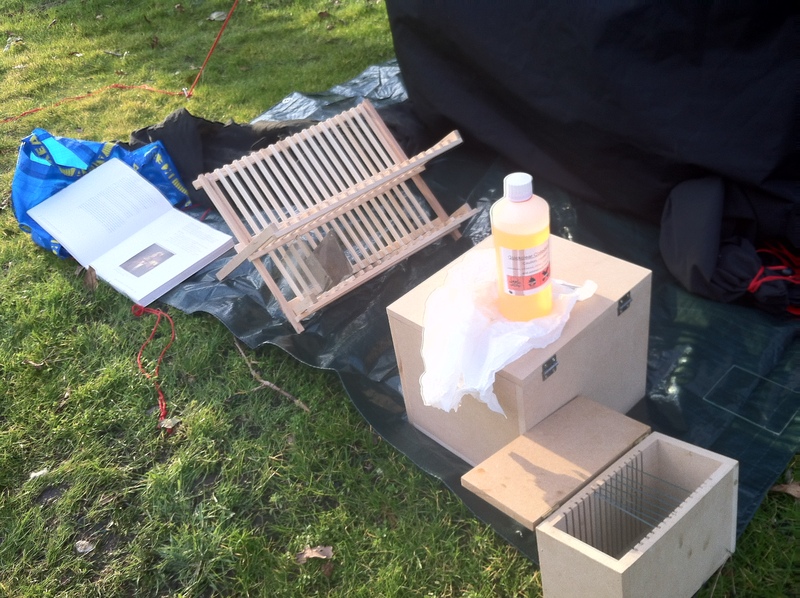 I constructed a pattern to which I would apply each chemical layer or each individual step to the process and I soon realised that extra equipment would be needed for the method of outdoor photography I am using. 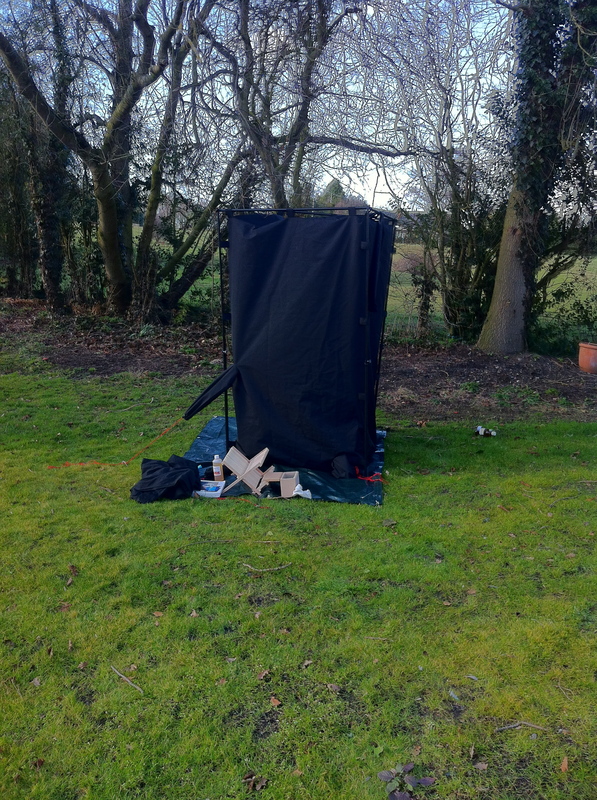 Aspects of being outside that you do not consider when gathering initial materials, for example wind breakers for the camera and portable dark room. A secondary table for aspects of the process that can be completed in the day light to allow for more control with certain aspect of the process e.g. 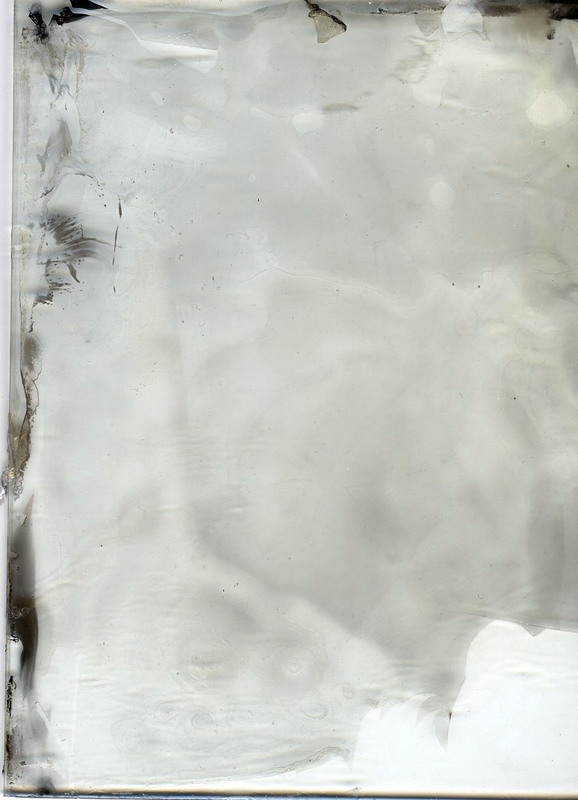 ‘flowing’ Collodion from comfortable standing height without bending. And I think I would also benefit from a better safe light for inside the dark room either to be charged by the car converter power source or alternative a stronger battery operated one. Expose plate- within camera in the landscape. Wash plate- in dark room to stop development. Leave to Dry- outdoors on equipment bench in a drying rack. 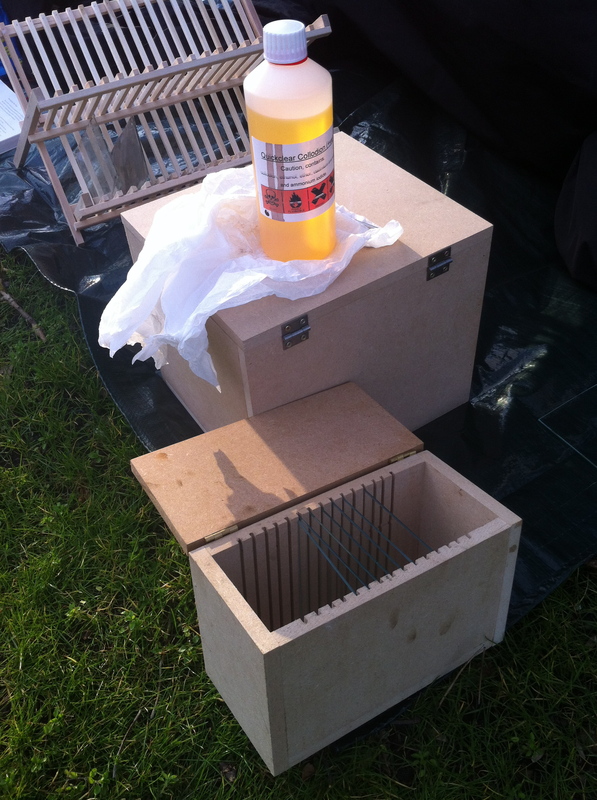 That evening I practised my varnishing techniques as it is recommended to protect the surface of the Ambrotype. 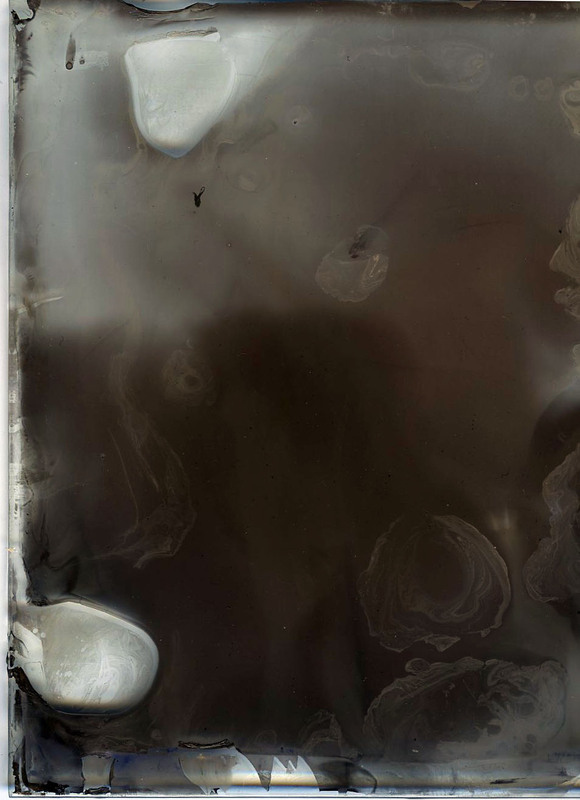 Which involves heating the varnish and the plate and ‘flowing’ the varnish similarly to the Collodion, instead of waiting for a skin to appear in the Collodion we are flowing the varnish before the plate cools. When it is covered it is left vertically in a drying rack to dry. The outcomes were not as expected and I will be retrying the technique again after I have done some troubleshooting regarding the process. As it is very unpredictable in there are many variables within the chemistry and my own actions that could effect the outcome of the plate. 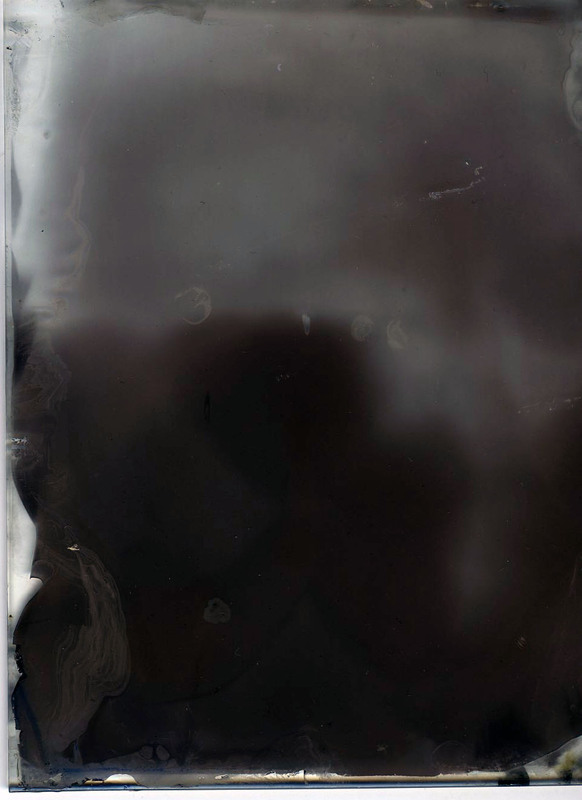 Below are the initial plates that I have made, I will attach everything to this blog including my mistakes as not only do we learn from them but the history of photography revolves around accidental imperfections and human error that amounts to discovery. Full List Of Equipment: Trial One. 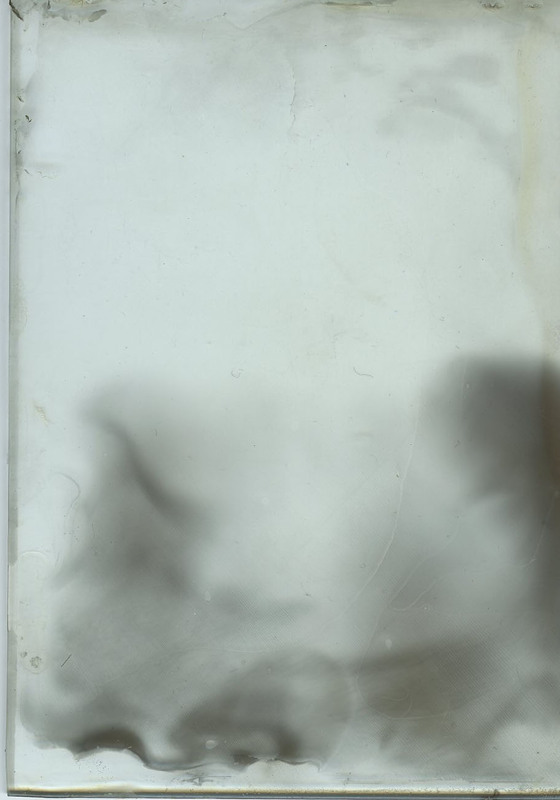 For my first trial with the positive Collodion process I am going to trial thirteen 4×3 clear glass plates that I have cut and filed to fit inside a 5×4 Fidelity Darkslide,which I have had to modify, from a paper fitting double dark slide to a single glass plate holder. I think planning is essential prior to the event of making as once I begin I will have little time to flick back through text books or consult other sources as to what apparatus I need to be using and what I need to be doing with it. In preparation for the actual making element for the Collodion process I have had to make further changes to the chemistry and I have also found it essential to write lists of materials and apparatus needed for each event. Required at least 24 hours before process for the Silver sensitising to work to its full potential. 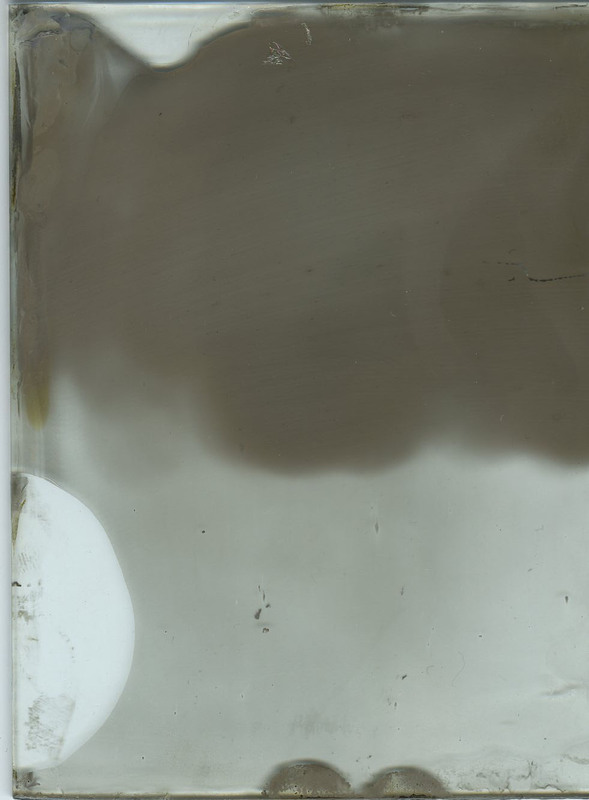 To achieve this I simply have to ‘flow’ a glass plate with Salted Collodion and leave in Silver Solution and leave overnight.